Only 11 percent of young New Yorkers voted in the last citywide elections. City residents between 18- and 30-years-old have the lowest voter turnout of any age or socioeconomic group. They are also least likely to be registered to vote. The Department of Education sends out 80,000 voter registration forms with diplomas each year, but there is no mechanism to monitor resulting registration numbers thereafter. 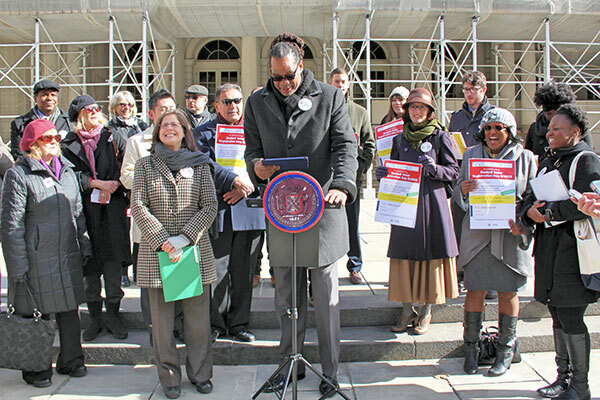 In response to these discouraging numbers, New York City Council Member Helen Rosenthal; several of her colleagues; NYC Votes, the voter outreach arm of the city's Campaign Finance Board; good government groups; and others have organized the city's first Student Voter Registration Day (SVRD) to be held at 25 schools across the five boroughs tomorrow, Friday, March 20. The pilot program is being launched Friday to commemorate Democracy Day, when 18-year-olds gained the right to vote on March 23, 1971. Students 17- and 18-years-old will be encouraged to register in their classrooms. "What we're going to do is not only register these kids to vote, but we're going to help them understand the value of voting and so hopefully they'll actually go out and vote," said Council Member Rosenthal at a kickoff rally on the steps of City Hall Thursday. The program will focus on civic engagement and youth involvement in politics. "Our challenge here is helping young people to connect the act of voting to their lives beyond the school walls," said Chyann Sapp, Youth Voter Coordinator for the Campaign Finance Board. NYC Votes and its Voter Assistance Advisory Committee have partnered with the Board of Elections, the Department of Education, the United Federation of Teachers, the Council of School Supervisors and Administrators, civic engagement groups, and others to formulate a curriculum that will show young people "how their votes can affect issues like the price of college, student loans, affordable housing and finding a job," said Sapp. The program is aimed at youth on the verge of becoming eligible voters, which is important in retaining them in the voting process throughout their lives, according to Board of Elections executive director Michael Ryan. "The inception of the voting process is registration," Ryan said, stressing that registration must be modernized to allow young people access to the voting system in a way that they feel comfortable with it. An early adopter on the campaign was Brooklyn Council Member Robert Cornegy, who emphasized the importance of the history of protests for voting rights. "Elections are incredibly powerful mechanisms for change, perhaps the most powerful tools we have in a representative democracy," he said. "That's why people risked their lives in Selma," Cornegy said, referring to Civil Rights Movement protests in the South, recently commemorated at fifty years. Council Member Mark Levine also spoke to history, and said that there is a need to change the current culture around voting in the city and the country. "The generation that came of age long after the Civil Rights Movement has taken this right for granted, this hard-fought right that many people marched for and some even died for. And if we're gonna change the culture, that has to start with young people and young leaders," he said. 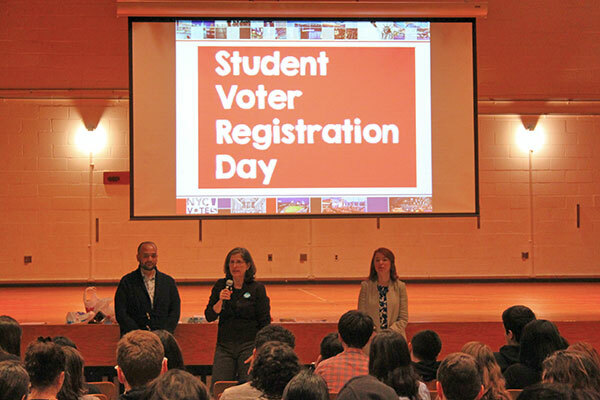 Student Voter Registration Day will not only focus on eligible voters. Recognizing the large immigrant population in the city, it will also involve education about the Deferred Action for Childhood Arrivals (DACA) and connecting young immigrant voters with their local representatives. "We need to not forget them," said Steven Choi, executive director of the New York Immigration Coalition. 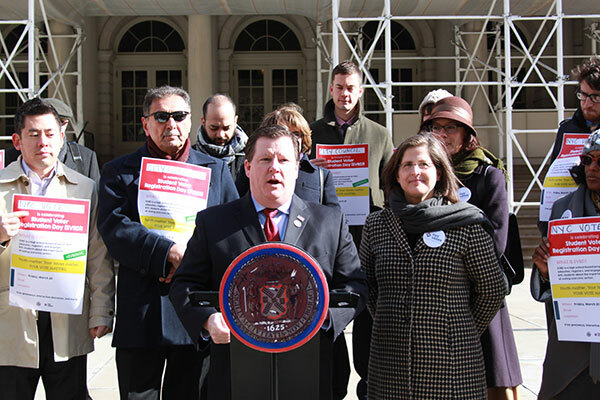 The initiative also has the support of many good government groups including Common Cause, New York Public Interest Research Group, and Citizens Union. "Public education was founded mainly to do three things: to teach people how to read, write, and to be active citizens," said Drew Lombardi from Generation Citizen, a civic education non-profit that works in city schools. Lombardi lamented that civic education has become a "secondary part" of school. Citizens Union's Peggy Farber hopes that SRVD would become a permanent civics education program across city schools: "By registering students, educating them about the importance of becoming active citizens, and helping them understand how to use their political voice, this program establishes healthy civic habits that will last a lifetime."